National and local papers often have articles on dormice. I’ve included a few here. Please let me know if you come across any. Could dormice be the undoing of quarry plans? Rare dormice have been recorded for the first time in an ancient Woodland Trust wood near Chelmsford thanks to the diligence of a local volunteer naturalist. WILTSHIRE Wildlife Trust is encouraging people to help locate populations of hazel dormice in the county by looking for nibbled nuts. In this job it is fair to say that one comes across many unusual job titles but Dormouse Officer is not one that easily springs to mind. A SILVERSMITH has been recruited by a national charity to cast 21 hazelnuts — in a bid to save the English dormouse. There will be a nut hunt this autumn when Northumberland Wildlife Trust supports the People’s Trust for Endangered Species (PTES) in its appeal to members of the public to help save endangered hazel dormice. dormouse?…nesting in a reed bed? Dormice wake up to a new dawn after years of decline22nd May 2009 Daily MailTwo of Britain’s best-loved wild mammals are making a comeback after years of decline, conservationists reveal today. 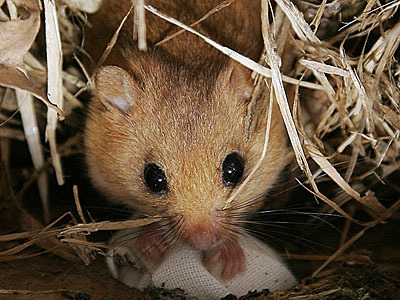 Dormice and water voles make a come back’22nd May 2009 TelegraphTwo of Britain’s best-loved wild mammals are making a comeback after years of decline, conservationists reveal today. Dormice decline ‘is slowing down’22nd May 2009 BBC NewsConservationists say they are encouraged by research which suggests that a decline in the numbers of dormice is slowing down. It has been a mild winter this year and it will be interesting to see how well the national population has fared given that hibernation is such a crucial time for dormice. Please make sure you send any results to Peoples Trust for Endangered Species for inclusion in the National Dormouse Monitoring Programme.